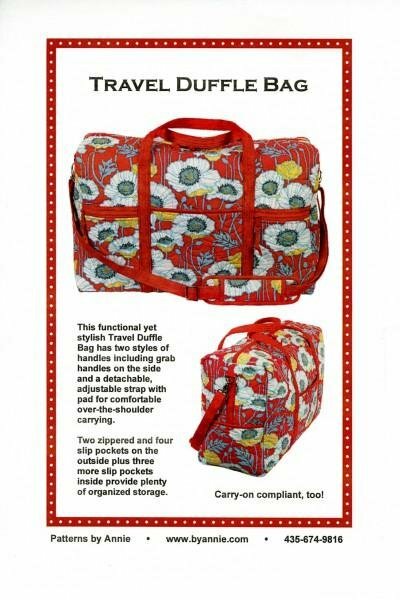 Travel Duffle Bag, pba-203, pattern By Annie. Functional yet stylish, this large duffle bag carries everything you need for travel — and still fits in the overhead bin. The full-zippered top allows easy access to all your gear. A comfortable padded adjustable carrying strap and quick-grab side handles make it convenient for all sorts of travel. With two zippered and four slip pockets on the outside and three more slip pocket inside, the bag will keep everything organized and close at hand. The Travel Duffle Bag measures 21"L x 13"H x 8"D.